Slouching, head hanging forward and sitting twisted – not good posture! The importance of good posture cannot be over-emphasised; it sets up habits for life. Children learn by modelling from their parents, so start by paying attention to your own posture. You are then in a better position (literally) to draw their awareness to bad postural habits and understand how to correct them if you have developed good habits yourself. A good posture is assesses in terms of a “plumb line” drawn through the ear lobe, the shoulder and the hip. This line should be perpendicular to the floor. The curves of the spine should be clearly seen, in balance with each other as they pass around the central line, and not excessive. The neck and low back should demonstrate a gentle “C” shape curve, with the thoracic spine (between the shoulder blades) gently curving in the opposite direction. The head should be held tall, with the chin not poking out. It is true that in children there are some normal postural variations, e.g. an exaggerated curve in the low back (lumbar lordosis) and sticking out tummy, that decrease through the adolescent years. However, the classic adult “plumb line” posture should be present by 16 years old. Even allowing for childhood variations in posture, characteristics such as rounded shoulders and slumped back are never acceptable and should be discouraged. Most adults, as well as children, sit in a slumped position. Very young children usually have an inclination to sit in a healthy position, upright and balanced with a straight back. However, as poor fitting furniture and a bad example from adults are imposed upon them, their sitting habits can rapidly be corrupted into the classic “slouch”, and it is common to observe this bad sitting posture even in primary school age children. So why is the typical slumped posture so bad? Sitting in a slouched posture means that the back muscles are in a lengthened state, leading to weakness, fatigue and strain. Furthermore, we know that poor sitting posture creates raised pressure in the discs of the low back, creating early wear and an increased risk of developing a disc prolapsed (i.e. “slipped disc”). Sadly, it isn’t that unusual to see teenagers with lumbar disc problems, and poor sitting posture is a major source of strain on the lumbar discs. Shockingly, one in four secondary school age children suffers from regular back pain, as discussed in “Back Pain in School Children: The Size of the Problem”. Correct sitting posture involves sitting with your bottom pushed towards the back of a chair, curves in back maintained (with a small cushion or back support placed in the small of the low back if necessary), feet on floor, and neck not drooping forward Ideally the chair height should allow the feet to be flat on the ground with the knees at a right angle. However, hard we try to reduce the amount of hours that our children spend sitting, it is inevitable that they have to spend several hours per day being sedentary, and will probably have to study from home too. Slouching on the sofa and being contorted on the floor are not good ways to sit for studying. Make sure that you child has a suitable place to do their homework – sitting at the kitchen table, or at a desk with a supportive chair. If reading for a long period of time they should try to prop their book up so that they aren’t reading flat from a table. It can be beneficial to take a break from reading in a sitting posture to break the forward head posture (see later). This might mean sitting in a reclined chair, bed or bean bag holding the book out in front of them. The same advice might be applied to lengthy times spent on any hand held device. When working at a computer, do your best to make sure that your child has a supportive chair. Apart from providing a suitable environment to sit properly, to best protect children’s backs, we also need to teach them about good posture. We all know that you can have the most expensive ergonomic chair and workstation set up, but you still need to sit in it properly to benefit. Equally, a modest chair can be more than adequate if sat in correctly. Show your child how to adjust their work station set up correctly for their height. The desk surface should be at the level of the child’s elbow; it may be necessary to raise the chair up to achieve the correct elbow height in relation to the desk. A support should be provided for the feet if they are no longer resting on the floor. The chair should support the curve in the lower back, and ideally encourage the pelvis to tip forward slightly to naturally maintain the correct curves in the spine. If this doesn’t happen, you could try giving the child a seat wedge to sit on, which tilts the pelvis forward and preserves the arch in the low back. Another possibility is to use a small cushion, or even a rolled towel, placed in the small of the back which provides a nice support to sit back against. However, this should not be big enough to push the whole body forward too much as it is good for the upper back to be able to rest against the back of the chair. Make sure that the screen is at eye level. It may help to sit on a cushion if the chair is too low/screen is too high. However, the most common problem is that people tend to have their screen too low, rather than too high. The screen resting on the desk top is usually too low. Try putting it on top of something to achieve the correct height. At Haslemere Chiropractic Clinic, our screen in reception is propped up on some wooden blocks, whereas at home it is on an upturned chocolate tub left over from Christmas. Tilting the screen can help to achieve the correct angle for good head posture too. Make sure when sitting at the computer that your head isn’t poking forward, either in concentration, because the screen is too far away, or because your eyes need testing! Some of the most common reasons for teenagers to consult me are neck pain and headaches, nearly always linked to having a forward head posture when studying, reading, and/or using hand held devices. Think of the head as a ball on a stick. When balanced perfectly on top of the vertical stick it requires very little effort to hold it up. If you start to tip the stick forwards, more effort is required to stop the stick from falling forwards. When this “cantilever effect” is translated into the practical impact on the neck and shoulder muscles, we can say that for every couple of centimetres you allow your head to come in front of your shoulder, you multiply by 10 the force required by the neck muscles to support it. You can then understand why we get an aching neck if we spend too long with our heads hanging forward looking at screens or reading books. The muscles quickly become fatigued. In addition, many of the neck muscles that become tense from this posture, and indeed the joints that get strained in these positions too, can refer pain to various places over the head causing headaches. Simple steps to adopt postures which reduce this forward head posture (see above – “Creating the right place to study”) can make a big difference, as can some easy posture awareness exercises. 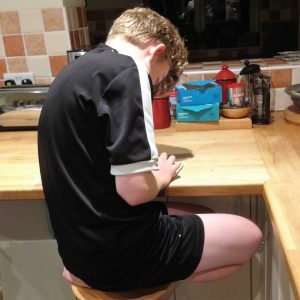 My experience of dealing with teenagers with musculoskeletal problems is that they are usually very willing to embrace advice about modifying posture, because they can easily understand the link between pain and how they are sitting and standing. Rather than telling them not to do something, I am teaching them how to do it in a way that has less impact on their body and will make them feel better, and that is a very positive thing. Although not directly relevant to this article, it is worth noting that slouched sitting and standing postures are linked with poor digestion and inefficient respiration. There is also considerable evidence that low mood and self esteem can be reflected in, and affected by poor posture. Lots of good reasons to encourage our children to straighten up! If you would like a FREE SPINAL CHECK-UP for your child, please call Reception on 01428 642778 and book a “Free Screening”.